May 17, 2016 - The Vishay Semiconductor’s Surface-Mount PAR® Transient Voltage Suppressor (TVS), a Vishay Super 12 Featured Product for 2016, is now available through New Yorker Electronics. 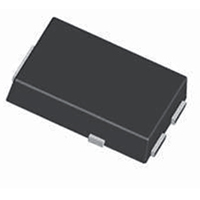 This TPC Series of TVS Diodes provides high temperature stability and excel in high reliability conditions. They are also the industry’s first bi-directional TVS to feature peak power dissipation of 1500W in the compact SMPC (TO-277A) package with a low 1.1mm profile. 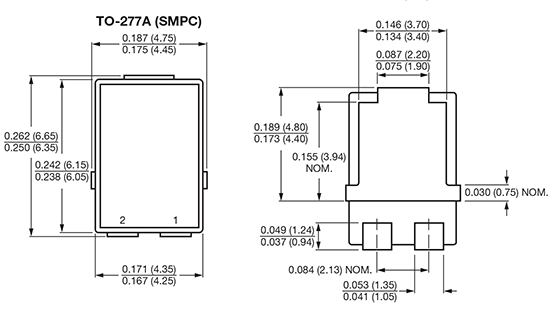 Therefore, the TPC series offers a 27% smaller footprint than devices in the traditional SMC package. The devices offer an operating junction temperature to +175⁰C to meet the high-reliability requirements of automotive, industrial and telecommunications applications and are AEC-Q101-qualified. The TVS devices are designed to protect sensitive automotive equipment from voltage transients induced by inductive load switching in accordance to IEC61000-4-4 and IEC61000-4-5, and electrostatic discharge (ESD) in accordance to IEC61000-4-2. To protect against voltage transients induced by inductive load switching and lighting, diodes on display include TransZorb® transient voltage suppressors with a ±3.5% voltage tolerance in the low-profile SMBJ (DO-214AA) package and bidirectional devices with 3,000W peak pulse capability in the SMC (DO-214AB). They also include surface-mount PAR® TVS with high surge capability up to 5kW in the SMC (DO-214AB). This series features patented PAR construction for a temperature range of –65⁰C to +185⁰C. The TPC series also offers a peak forward surge current of 200A and ‘excellent’ clamping capability from 10.5V to 61.9V. Ideal for automated placement, the TPC series offers low incremental surge resistance and fast response time. The devices meet MSL Level 1 standards, per J-STD-020C, are compliant with RoHS directive 2002/95/EC and WEEE 2002/96/EC, and are halogen-free in accordance with IEC 61249-2-21. The new devices are also qualified to AEC-Q101. They are ideal for use in sensitive electronics protection on ICs, MOSFETs and on signal lines of sensor units for automotive, consumer, computer, industrial and telecommunication applications. New Yorker Electronics is a franchised distributor of Vishay products and carries the entire line of 2016 Vishay Super 12 Featured Products.